The history of the Royal Villa is as eventful as is Belgium’s. 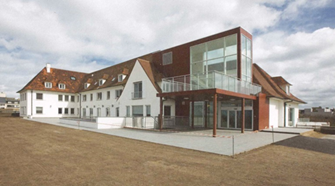 It has been a wooden chalet, a villa, a restaurant and today it is a care hotel and rehabilitation centre. This special building has had a lot of purposes over the years. King Leopold I had two wooden chalets built right between the dunes of Ostend, on what was the border with the municipality of Mariakerke. These served as temporary residences. 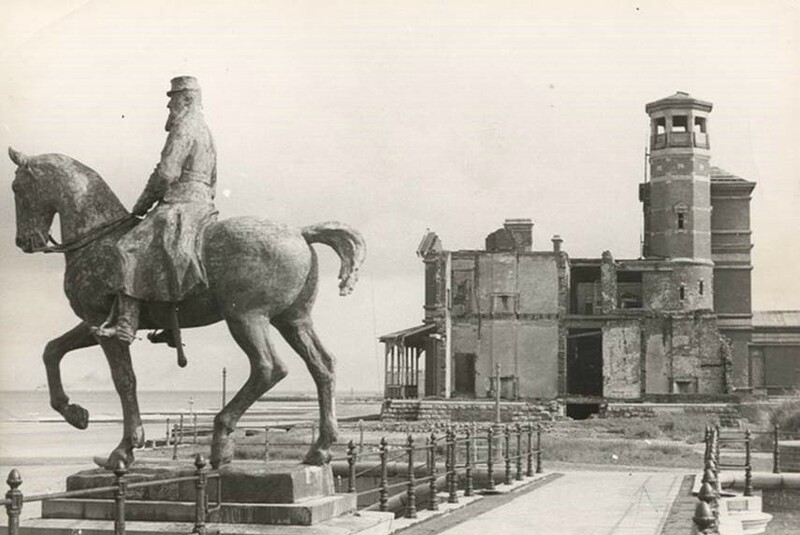 In 1865, Leopold II ascends the throne and he wishes to see the soon to be built Kursaal from his palace. He summons A. Alphand, an engineer, from Paris in 1867 to prepare the construction of a new palace. The chosen location is that on which Leopold I’s two wooden chalets sit, looking over the dyke. A group of English contractors build the wooden palace designed by W.J. Green, following instructions of the king himself. The new palace is inaugurated in 1874. In 1876, contractors from Ostend start constructing a similar pavilion for queen Maria-Hendrika, but this time bricks are used. A glass gallery measuring 46 metres connects the two chalets. The king buys up the lands surrounding his chalet and has them stripped completely to design to his liking. The area of Mariakerke that is located east of the Parijsstraat is annexed to Ostend. This means the entire area between the Royal Chalet and Mariakerke is under construction. The lands surrounding the Royal Chalet stay neglected for a long time. The royal family ends up buying them and has the Venetian Galleries built on them in 1900. During construction, Leopold II wants to embellish the dyke connecting Ostend and Mariakerke. His influence makes it a real promenade. 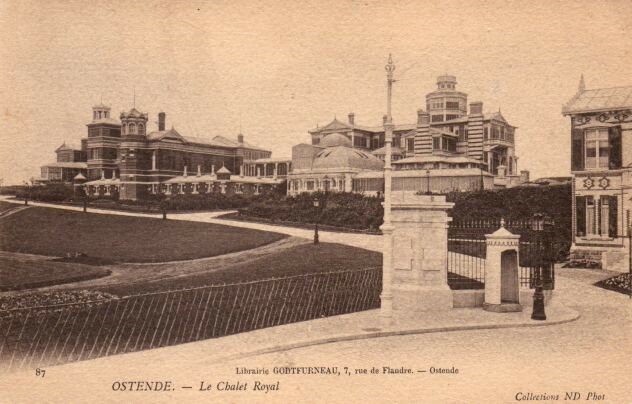 In 1902, they start working on the Royal Galleries, which are located in between the Royal Chalet, the Royal Palace Hotel and racetrack Wellington. Before World War I, the Sea Dyke developed into a holiday destination full of villas and hotels. Because of the war, though, all that comes to a temporary halt. During the interbellum new hotels are built. One of them is the prestigious “Palais des Thermes”, constructed in 1933 behind and on top of the Royal Galleries. But from the very start, the hotel has management issues. 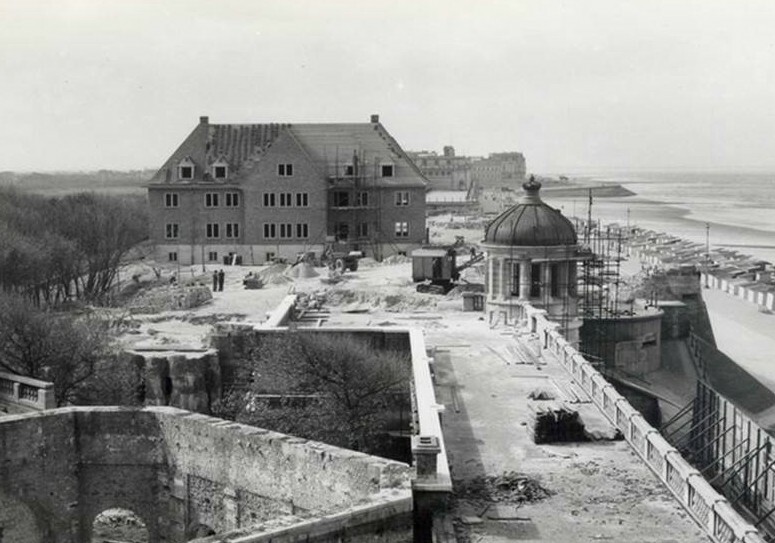 Construction was finished way too late to benefit from Ostend’s golden years as a bathing city. Due to mass tourism with recreative needs all through the interbellum, the idea of an exclusive complex serving as a luxurious hotel/thermal institute is already largely obsolete. The privileged guests are more attracted by the weather and the quiet than by the reputation of health the complex has. That is why the start of World War II means the end of the hotel. 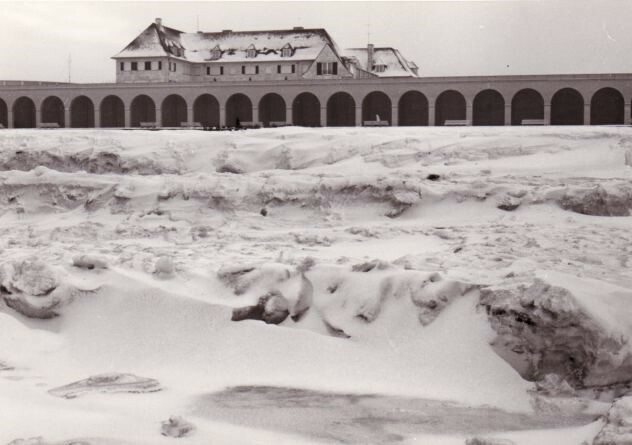 World War II severely damaged the buildings on the Sea Dyke, like the Royal Palace Hotel and the Royal Chalets. 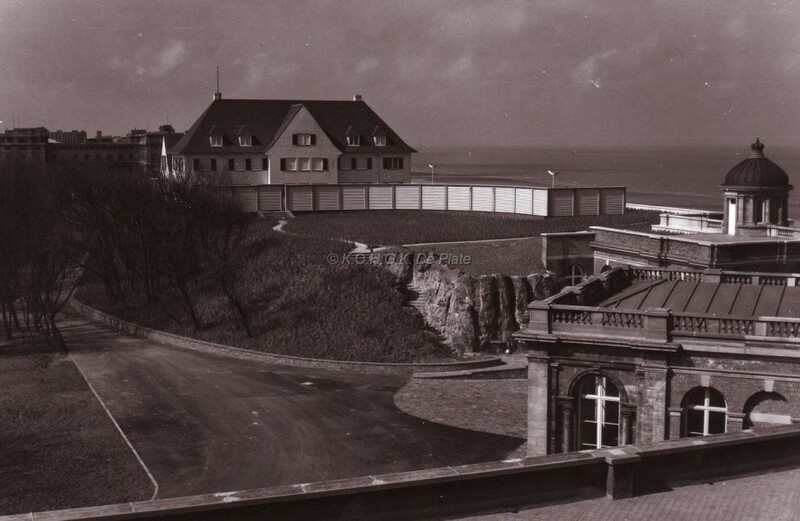 Between 1953 and 1956 the Royal Chalets are replaced by a villa designed by architect A. Dugardyn. 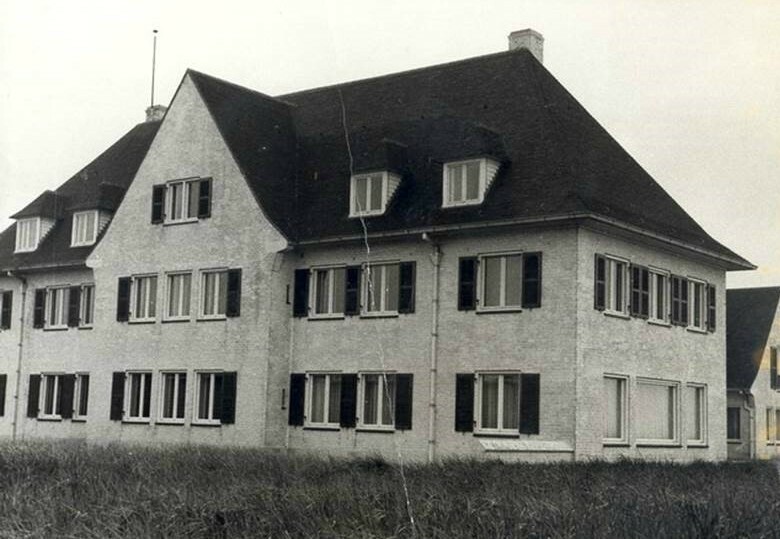 In 1957 the royal family stayed there for the first time and for years to come it would be the royal family retreat. During the seventies, the royals started preferring Italy and Spain as a holiday destination, so the building was neglected. After that, it was turned into a hotel (Ostend company) and then into a restaurant (Au vigneron). In 2004 the restaurant closed the books and the building was abandoned yet again. That is, until BZIO got the leasehold in 2005 and initiated a thorough renovation. The Royal Villa opened her doors in 2011 and has served as a care hotel and a rehabilitation centre ever since.